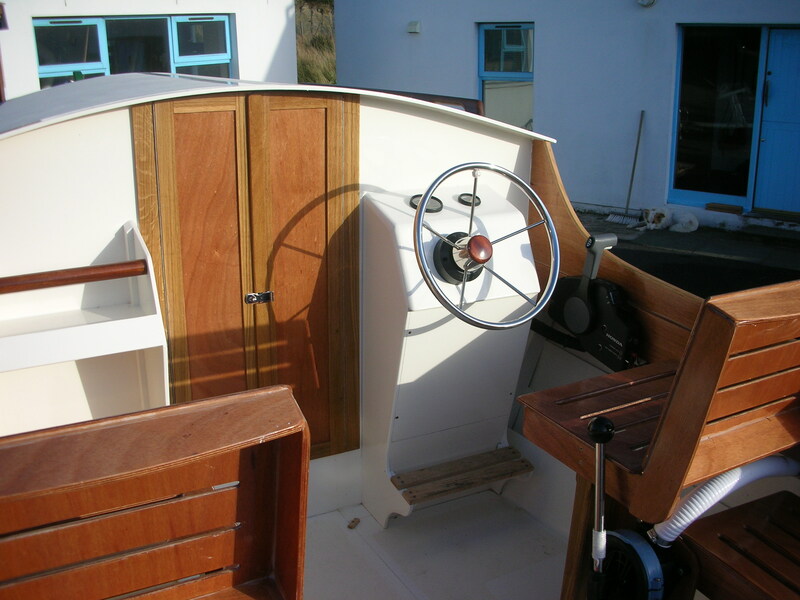 Roeboats are delighted to offer you Ninigret a 22’motor boat designed by John Atkin. The Ninigret has a large cockpit that comfortably seats 6, two berths and a sea toilet (head). Primarily, what attracted me and my client to this boat were its good looks; but it has many other great features that you come to love, one of these was that the motor is housed in a covered well thus reducing noise and protecting the cockpit from following seas. Keeping you dry and comfortable no matter what. As you can see she rides flat and with her fine entry should have no trouble slicing through choppy waves ensuring a dry and comfortable ride. 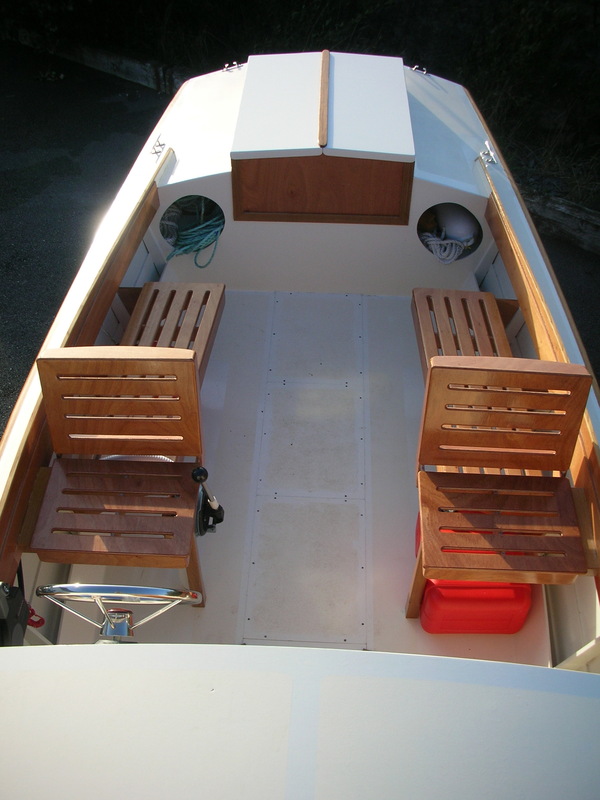 The 25 to 45 horse power outboard under the hatch at the aft end of the large cockpit drives the boat to speeds from 15 to 20 knots which is plenty fast for heading to your favourite fishing spot or beach. The fact that this boat not only has a large cockpit but two berths and a sea toilet is really amazing and a credit to the designers ingenuity and creativity. Being a designer myself I can appreciate the hours and hours of thought and sketching that must have been done to produce such a classic. 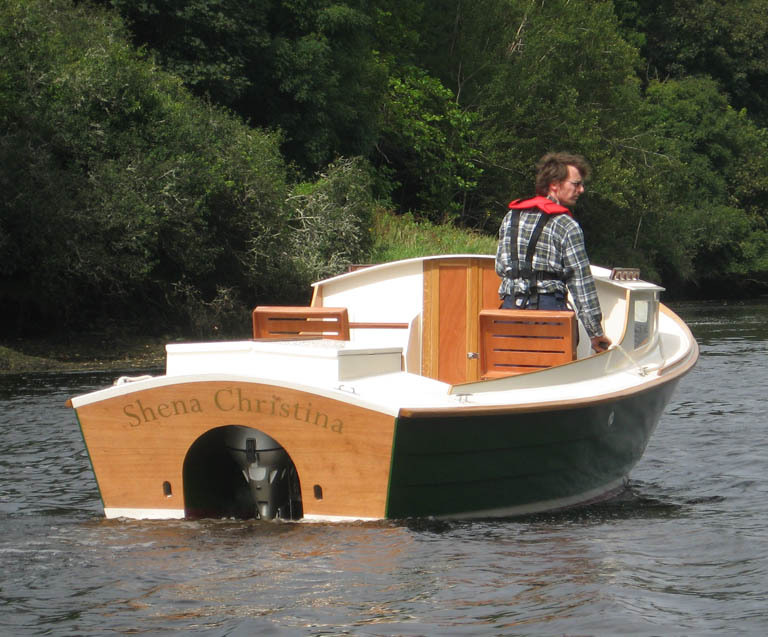 If you would like one of these boats for yourself contact Tiernan Roe at +353 (0)28 38973; I would be delighted to discuss building another for you. The one pictured costs 29,500 euro boat only and when the engine and trailer are added the price is still well below a rib of similar size with a hell of a lot more comfort and style. She also uses way less petrol to boot, good for your wallet and the environment.